Kampala, May 21, 2017 (SSNA) — A former Ugandan intelligence officer James Moises has accused Western countries of complicity in the going South Sudan’s civil war, claiming that Western nations have allowed South Sudan’s neighbor, Uganda, to manage South Sudan’s peace process. Moises, who is widely credited for exposing Uganda’s involvement in South Sudan’s civil war, criticized the West for what he described as “what we want first, regardless of the amount of blood spilled,” asserting that the West under the Former United States President Barack Obama was in a secret agreement with Uganda. In early April, the South Sudan News Agency (SSNA) received an invitation from Moises, wanting the SSNA to interview him, claiming he is ready to drop what he described as “the mother of all secrets.” The request took the SSNA more than a month to coordinate with Moises. In an exclusive interview conducted on Friday and Saturday, Moises surprised the South Sudan News Agency’s team at the meeting place by first introducing everyone at a seemingly educated group of all men as “friends” claimed that he is at war with current Ugandan president Yoweri Museveni and that he was killed in March 2017. “First, I would like to announce to you and the world that I was killed in March this year, but I am still here. An innocent man called Assistant Inspector General Andrew Felix Kaweesi was killed in March by Yoweri Museveni thinking he was me,” he declared. As the interview progresses, the former Ugandan intelligence agent demanded that everyone in the room leave, but asked three well-dressed men he called “lifetime friends” to stay. “Hey leave, except you, you, and you,” Moises declared in front of an all-men audience. “South Sudan civil war was manufactured here in Kampala. That guy of South Sudan [Kiir] gave Museveni anything he wants. The West under previous American President Obama was all about what we want first, regardless of the amount of blood spilled. I was deeply disturbed by orders and assignments I was given by my cold-blooded leader Museveni. The West under Obama was acting like Uganda’s client. They have no clear say at all, they failed the young nation, and Uganda was the manager of everything related to South Sudan’s war,” Moises declared. 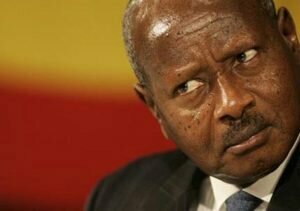 “Yoweri Museveni is very good at manipulating Western leaders,” he recalled. On Saturday, Moises told the South Sudan News Agency that he has just finished compiling a “bombshell report,” detailing his intelligence works in South Sudan, adding, “I will give the mother of all secrets to a world-class intelligence agency to expose all fingers involved South Sudanese civil war,” he continues. Moises claimed in March that the Egyptian government has sealed a deal with Kampala and Juba to harm Addis Ababa. Most South Sudanese agree that the current South Sudanese president Salva Kiir is still in power because of Uganda influence. Kampala refuses to accept any foreign intervention in South Sudan, claiming it will only escalate the situation. You may be true, because oboma has got no say on South Sudan problems at all, we need peace but nothing is happening. No peace talk taking, people are talking of foreign intervention toward south Sudan,yet there nothing happening, we call for peaceful talk no consideration, what you want then , you want to see south Sudan without human being to take over seem on you west. respectful name of a south sudanese citizen supporting a foriegn intervention is no partriotism at all. Would you consider it as “patriotism” when a government is left to senselessly murder it’s own people unchecked? If that is it,patriotism should go down the drain. What James Moises says is 100% True, But what is missing is why Obama (allowed Clinton Foundation/Clinton State Department) to exploit 🇺🇬🇸🇸; Obama did allow 🇺🇬🇸🇸 To be sold out, but he must have reasoned/rationalized it. It would be helpful to get his reason for allowing this from Obama himself AND also a statement from Trump Administratin on how different and/or similar his Administratin will be when working with 🇺🇬 & 🇸🇸, esp now that Clinton Foundantion and all of its ‘donor relationships with African Elites, including Uganda’ have been rendered worthless as soon as Trump WON POTUS & Clinton LOST. Thank you Mr moises former officers of Uganda for report that you reported for south sudan war and the Western world assure for it. What James Moises says is 100% Correct, However, perspective/reasoning of former USA President Barack Obama is missing and would be useful, i.e., What was former USA President Obama’s rationale, his reasoning, why did he allow peace in South Sudan to be compromised by interests of Ugandan Elites, why ‪did he turn a blind eye/allow His Dept of State to work with Clinton Foundation also in the process of enabling and compensating Uganda for ‘managing’ South Sudan? Because again what James Moises says is true BUT the reasoning of Obama in allowing this should be shared too, I have a feeling it would reveal a hard choice between lesser of 2 evils, best possible outcome out of no perfect outcomes or simply somebody was going to benefit from this Uganda – South Sudan situation, might as well be us, aka Clinton Family, Clinton Foundation, Etc. Mr Moise that you for that report. This report is not going to be taken seriously by the international community but it is helping us south Sudanese know that president museveni is a problem to the sisterly country. I say sisterly country because Our people from northern Uganda are the same with my brothers from equatoria so what I would like to tell my fellow brothers the Ugandans is that be careful because after the Dinkas are done with equaterian they will not differentiate you Ugandans and equatorian remnants. For you to enjoy south Sudan be supportive of the rebels who are composing of all tribes they present national identity. No patriotism hahaha heeee ooooh for those who do not know the mess let tgem one day use nimule juba road they will see the drama. well dressed government soldier looting civillians properties e.g windows iron sheets house hold items shamelessly even sweet cassava selling them to the travellers what type of mess is this .